It’s that time again! Walk with me through the Chance Rides factory to see what is about to roll out to your favorite attraction. First up a couple of familiar items from last month. This unique carousel was just inspected by the customer this week. Now that its been approved the disassembly is starting. It will be shipped in cargo containers to its new location in Korea. And here is a look at the Electric C.P. Huntington train that is being tweaked prior to shipping out for actual in field testing. Once it is installed we’ll be sharing some more information about where you can see it in operation. You can also see a Tramstar in the early stages of production in this photo. The Chance Rides people movers are the most comfortable, high-capacity, open air trams in the industry. 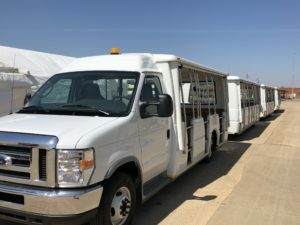 We start with the chassis from a Ford E-450 and convert them into the Tramstar or Sunliner II people movers. Below is another photo of the production set up for this particular trailing unit. The El Paso Zoo is about to receive their new wildlife carousel. It will be a feature of their new Asia Gateway. The 36ft carousel features endangered species and a birds nest spinning tub. The carousel will be placed under a special shade structure that will protect the carousel as well as make the rides more enjoyable for guests. In the image below you can see the specially designed trailer that Chance Rides uses to deliver carousels. 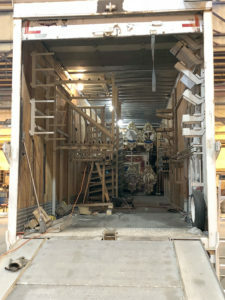 This trailer ensures that all of the carousel elements are secured safely and arrives to the new location in pristine condition. Our ornate endangered species scenery can be seen at the back of the trailer. Guests to the El Paso Zoo will be able to ride on this magnificent carousel this spring. Another familiar project from last month is this awesome family roller coaster. This fun coaster for the whole family will be installed this fall. The track you can see here is the braking run as riders come back to the station. Soon these pieces will be disassembled for painting. And then piece by piece it will be prepared for shipments to the yet to be announced location. I can assure you this family coaster is going to be a fun ride for the whole family. Outside I was able to spy a couple of the coaster columns that have already been through the paint line. It is honestly fascinating to see these ideas come together from a drawing to a real ride. Each piece meticulously constructed just as it was designed to fit together for an amusement that millions of people will come to enjoy. Most will likely never think of the skilled workers who spent so many hours ensuring that it was manufactured correctly to provide a smooth and safe ride. Our workers don’t mind if you don’t think of them, they are just proud to put out rides that so many people can enjoy. While I was making my rounds outside I also spotted another Tramstar set that was in its final testing stage just before being shipped to the customer. Each of our power units can pull up to three trailing units accounting for a total capacity of 104 passengers, with even more than that in our Sunliner II units. Easily the industry’s most comfortable way to move over 100 guests at the same time. Before heading back inside I went out to the paint shop to see what was moving through there. I was excited to see that I could give you all a look at the way we finish our Lexan scenery panels to ensure that they have a long last finish. Paint is applied to the inside of the clear panel in layers so that it is ultimately protected from the outdoor elements. The layers create the finished, detailed look that Chance Rides is so well know for. After I reviewed the paint booths I headed back inside to get back to my office. Before heading upstairs I stopped by the shipping and receiving area. As you can imagine the parts that we ship out of here on a daily basis are not your typical widget. We have a huge inventory supply on hand so that we can limit the amount of time that a ride may be down waiting on replacement parts. And now we have introduced the opportunity to purchase replacement parts for Chance Rides products online. We are continuing to work on adding more products to the site all the time. You can go to parts.chancerides.com to register for an online account. Thanks again for taking this tour with me today. We’ll be back to show you what is happening in April. Let me know if there is something in particular that you’d like to see. And definitely let us know if we can help you with some information about a new coaster, ride or people mover.